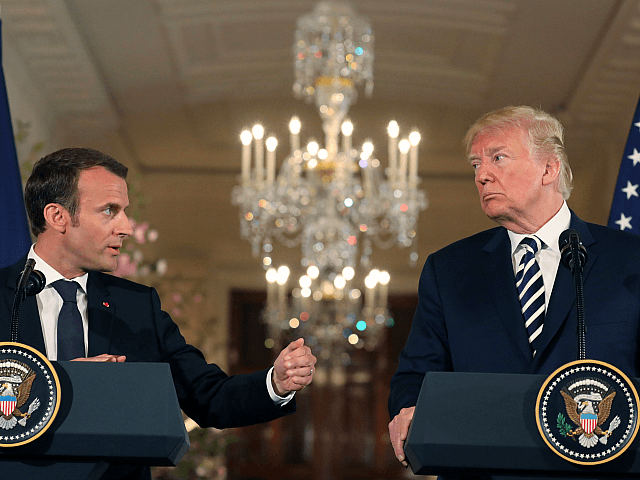 In August, Macron called for defence divergence from the United States, then including current French foe Russia as those the centrist premier counted as possible European defence partners. Last year, the European leader led the charge for a United States of Europe with a full monetary union and a single army, the EU making the first major step towards the latter in November after 23 member states signed the European Defence Union’s Permanent Structured Cooperation process (PESCO). Macron has been building his international profile based on his opposition to the policies of U.S. President Donald Trump, seeking to forge a ‘European front’ against the American leader ahead of the G-7 Summit in June — with Trump schooling his fellow progressive world leaders on ‘America First’. While at the United Nations in September, Macron, who has fallen to an all-time low of 21 per cent popularity in his home country, attempted to give a defence to globalism while criticising the pro-sovereignty, strong borders vision of President Trump’s America.